Sand, Branches, Shadows. © Copyright 2019 G Dan Mitchell – all rights reserved. 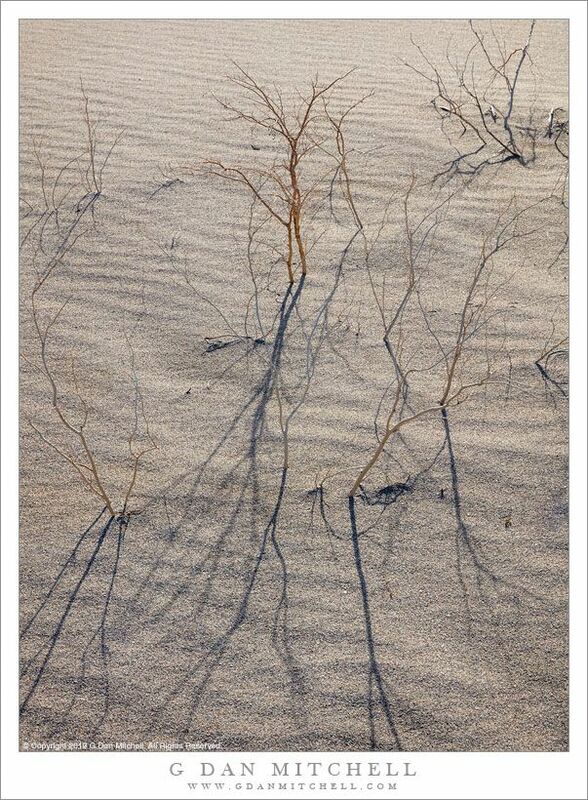 Shadows of dried branches on windblown sand dunes. A small group of photographers ventured into the dunes early on this late-winter morning, starting out from the nearby roadway in pre-dawn darkness. As we walked the sky began to get lighter and before long we could begin to make our our surroundings and our destination in an out-of-the-way area of dunes. Along the way we were surprised — though in retrospect we should not have been — by muddy areas still soaked by recent rains. The sun still was not up when we arrived at the edge of the dunes. As a group of five photographers we encountered a slight challenge — compared to when we photograph such places alone, we found that we had to consider every step regarding how our tracks would potentially intrude on our partners’ photographs! While dunes are mostly sand, there is quite a lot of life there, too. Early in the morning it is common to find the tracks of lizards, snakes, birds, and even small animals. Here and there plant life can be found, too. These spindly branches mostly looked dead, though a few retained the color of living plants and might soon put out a few post-rain leaves.